Since last Spring, I've been researching and writing about Color Cubes, one of my favorite pieces of public art in Detroit, and David Rubello, the artist who designed it in the early '70s. I've admired Color Cubes for a little more than ten years, I guess -- since I really started paying attention to the downtown landscape. That admiration deepened in 2009, when Michel and I stumbled upon a poster-sized version of it, painted in acrylic, at a local junk shop and happily hung it in our home. 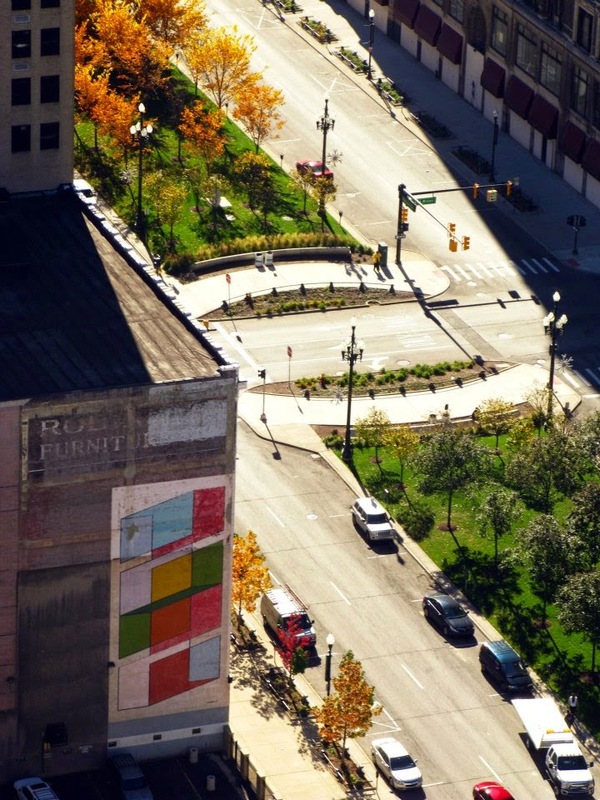 (I later learned that Rubello had originally painted it in 1973 for the downtown offices of New Detroit, the group that commissioned the mural.) But it wasn't until Color Cubes was painted over last May that I became seriously interested. Over the last five months, I've spent a considerable amount of time conversing with the artist, photographing his work, and doing historical research about the circumstances surrounding Color Cubes' creation and destruction. Hamtramck-based artist, writer, and gallerist Steve Panton is currently leading Essay'd, a great effort to publish short, illustrated biographies of Detroit artists online. When he asked me to contribute one on Rubello, who has had a long and interesting career, I was glad to oblige. This feature article, published in the Detroit-focused online magazine Model D, introduces David Rubello to Detroitophiles and explores the remarkable circumstances under which Color Cubes was commissioned in 1972. I'm grateful to Model D's Matt Lewis for the opportunity to tell the story in this form, which gives it the chance to reach a wide and enthusiastic audience. This is the big one. It was the invitation to contribute something to the November 2014 edition of Infinite Mile, an online journal of art and culture in Detroit, that originally inspired me to learn more about Rubello and his lost Color Cubes. Over several months of research, I became convinced that I needed to find a new form in which to tell this story, a form that was inspired by the mural and that freed me from the familiar constraints of the essay. Encouraged in this pursuit by Stephen Dewyer and Jennifer Junkermeier, Infinite Mile's editors, I partnered with my friend Jonathan Gabel, a gifted artist and web developer, to make "the matrix," an interactive web feature that investigates Color Cubes aesthetically, culturally, and historically. Since it's meant to be explored over time rather than digested all at once, the matrix is very information-rich. As a result, it also serves an a kind of reference work for people who are interested in Color Cubes, David Rubello, and/or early '70s public art in Detroit in general.